It is a truth universally acknowledged that an actor in possession of a woman’s story must be in want of a wife - to help him adapt it. Charles Ross (One Man Star Wars, Lord of the Rings, Batman, Stranger Things) and visual artist Lisa Hebden tackle the greatest romantic comedy ever. The intrigue, dancing and proposals (did we mention the lace?) are given the one-man once-over. We hope you roll in the aisles - not Jane Austen in her grave. This solo show by Fringe veteran Charlie Ross (of One Man Star Wars, etc.) 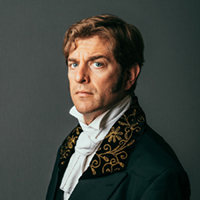 is less about Jane Austen’s work and more about showing off Charlie’s chops on stage. He had the audience from the get-go, so it’s safe to say they were familiar with his work and wanted more. His costume is divine, though without the promised lace. This show is a romp. Silly, all over the place but it is entertaining enough and fun. If you are wanting a serious rendition of Austen, this is not it; but you will be entertained nonetheless. Ross is a wonderful performer. This venue is stacked with winners, so stay the day and catch some of the best the Fringe has to offer.